Australian shares surged the most in two years in a sweeping Asia-wide rally triggered by the world’s leading trade partners, the US and China, agreeing to put the trade war on ice for three months. The S&P/ASX 200 Index yesterday added more than 100 points or 1.84 per cent to 5771.20 points, the biggest gain in a single session since November 2016 when Donald Trump gave his victory speech in the presidential election and fuelled hopes of an American investment boom. Asian equities rallied even harder on Monday, gaining more than 2 per cent in Hong Kong and Shanghai. The decision to call a temporary halt to the tariff battle also set-off a rally in the oil price, ahead of a hotly anticipated OPEC meeting on Friday where traders expect members to agree to a reduction in output. BHP Group jumped almost 4 per cent to $31.82; Origin Energy more than 6 per cent to $6.87 and Santos almost 9 per cent to $6. “There has been excessive pessimism around Asia as financial markets have sold off [emerging markets], and in particular Chinese stocks, off the back of trade wars; now we’re starting to see markets realise there was probably too much pessimism,” said Garry Laurence, head of Perpetual’s global shares strategy. 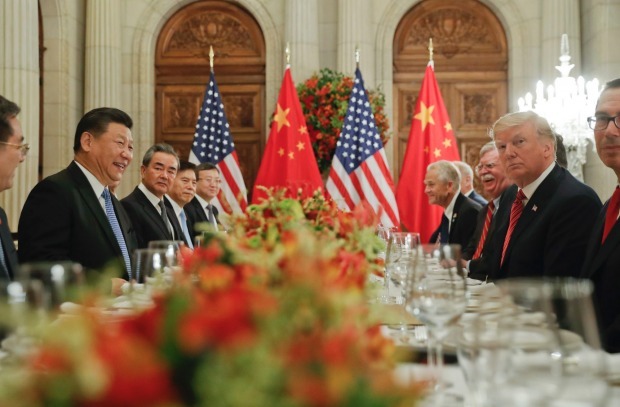 At the G20 meeting on the weekend in Argentina, Donald Trump agreed to hold off imposing the new tariffs subject to a series of concessions being met by Xi Jinping. Although the outcome of the Group of 20 meeting on the weekend was temporary in nature, investors bet that Mr Trump and Chinese President Xi Jinping will work toward a more permanent deal. “It’s a positive development that it is not spiralling out of control. That’s why we are seeing a bounce,” said Vertium Asset Management portfolio manager Jason Teh. The US slapped tariffs on Chinese imports this year while complaining about the wide and growing trade deficit between the two superpowers. Mr Trump has threatened to increase the tariffs already in place on $US250 billion ($340 billion) of Chinese imports from 10 per cent to 25 per cent on January 1 next year, and impose new tariffs on a further $US267 billion of Chinese goods. But at the G20 meeting on the weekend in Argentina, Mr Trump agreed to hold off imposing the new tariffs subject to a series of concessions being met by Mr Xi. China’s economic growth has already slowed this year, notwithstanding some measures by the government to stimulate areas of the economy. The effect on Asian equities has been devastating, but the trade war has also caught out US carmakers whose shares are in correction territory as input costs rise with tariffs on steel and aluminium. General Motors said in November that it will close five factories and lay off nearly 15,000 workers. The GM decision supports a growing consensus that the US economy is close to or has already peaked in terms of output. As the global economic backdrop has become more fragmented and uncertain, deviating from last year’s story of synchronised solid global growth, the trade tensions between the US and China have taken on added importance for markets. When the US and China are at odds with each other, “it’s a headwind in a difficult environment”. The Australian dollar was trading at US73.62¢ late on Monday, trading strongly on what ANZ called the “co-operative tone” from Argentina. In arriving at a ceasefire, China agreed to buy more goods from US agriculture, energy and industrial producers. US West Texas Intermediate crude futures climbed $US2.76, or 5.4 per cent, to $US53.69 while Brent crude futures rose $US3, or 5.1 per cent, to $US62.46 a barrel, although the contract is still well below its October high of more than $US80 a barrel. On Sunday, Canada’s Alberta province agreed to cut output to deal with a pipeline bottleneck that has led to crude building up in storage. While the trade war has cruelled a large portion of global stocks, it appears to have helped cement the valuations of some of the market’s most expensive names as investors look for safety in pockets of the equity market. China’s CSI 300 Index is still down 19 per cent year-to-date. “Cyclical companies around the world have been sold-off and de-rated significantly,” Perpetual’s Mr Laurence said. “Whether it be automation companies in Japan, any sort of industrial company in Europe, automakers in the US. Some of these companies are pricing in recession. People have been hiding in assumed quality stocks as well as some of the defensive parts of the market which have stayed expensive. China’s factory activity grew slightly in November, according to the Caixin/Markit Manufacturing purchasing managers’ index. The index ticked up to 50.2 from 50.1 in October, just above the 50 level that economists had been expecting and that also separates economic expansion from contraction. Previous articleDid Georgia Get Screwed out of the Final 2018 College Football Playoff Spot?